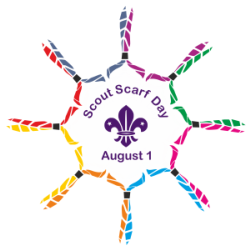 The idea of "Scout Scarf Day" on August 1 is that all active and former scouts are requested to wear their scout scarfs in public to make the "Spirit of Scouting" visible: Once a Scout - Always a Scout! The date of the event commemorates the very first Scout Camp on Brownsea Island in 1907. Of course, the scarf is only a symbol but a strong symbol for the scout promise and for our mission to leave the world as a bit better a place than we had found it.